Are you thinking about moving to Italy? If you are thinking of moving to Italy to become a full time resident, or even a resident for part of the year, then it make sense to understand your tax and other financial liabilities before you make the move. When you buy a house in Italy, you will very likely receive competent and complete advice regarding the cost of buying and renovating a house. The agent may also explain the difference between the cost of buying as a resident in Italy and a non resident. But, the buying process should be accompanied by a clear and concise longer term financial plan to minimise tax liabilities. Italy has its own tax code and its own preferred set of tax efficient savings and investments products and whilst you may think that you can take advantage of the same financial benefits as you have done in your home country they may not represent the best and most efficient ways to hold your incomes and assets, whilst living in Italy. Tax efficient accounts in one country often have no relevance in Italy. But there are alternatives available which could save you money. Sadly, and all too often, expats fail to do sufficient tax and ongoing planning for living in a country which has a very different set of rules to their own and as a result end up paying more than they need to, getting fined for simple and honest mistakes and in the worst case scenarios needing to return home. 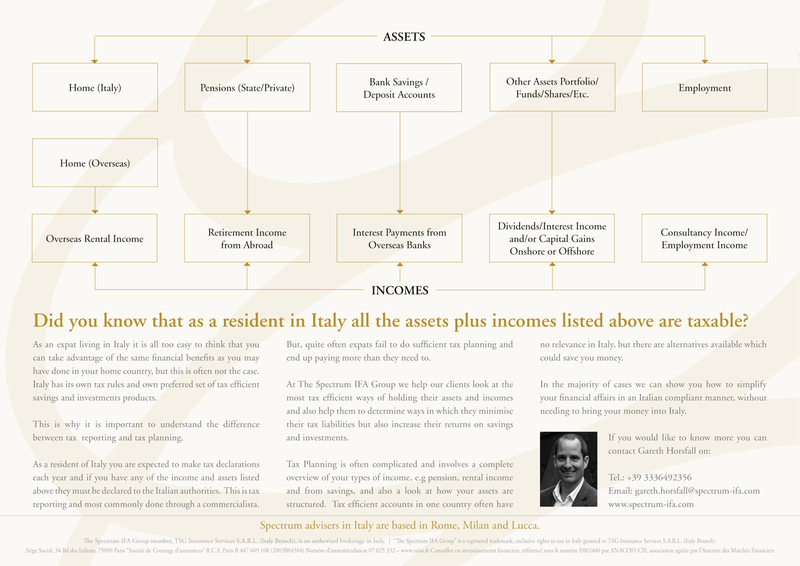 At The Spectrum IFA Group (Italy) we can help you to not just look at the initial financial aspects of moving to Italy, but also to help you look at the longer term consequences and avoid any inevitable surprises once you have made the decision to purchase property in the country. We want to ensure that your dream move continues to be a dream. We can help you look at the most tax efficient ways of holding your assets and incomes taking into consideration both Italian tax law and that of your home country and ultimately help you to minimise your tax liabilities. Cross border Tax Planning involves a complete overview of your types of income, e.g pension, rental income and interest from savings, and also a look at how your assets are structured. In the majority of cases we can show you how to simplify your financial affairs in an Italian compliant manner without needing to bring your money into Italy.